4 SIZES NOW AVAILABLE! 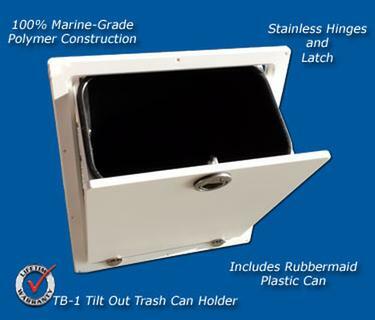 This tilt out storage box is ideal for things like sunscreen, sunglasses, tackle, etc. The compact size allows installation almost anywhere and takes advantage of available space. 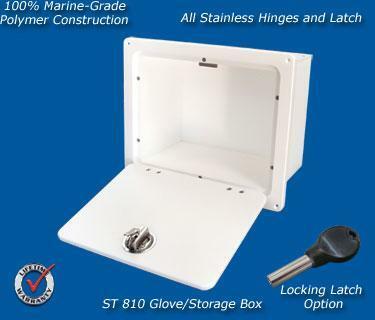 Includes all stainless steel latch and hinges. Can be opened fully to access area behind box. Removable foam pad in bottom. Overall dimensions are; (FMT-1) 8" x 16" x 4" deep, cut out dimensions are: 13 1/2" x 6 1/4". (FMT-1-11) 11" x 7 1/2" x 4 1/4" deep, cut out - 9 1/2" x 6" (FMT-1-13) 13" x 8" x 3 3/4" deep, cut out - 11 1/2" x 6 1/2" (FMT-1-24) 24" x 9" x 5" deep , cut out: 22 1/2" x 7 1/2" (FMT-1-32) 32" x 11" x 6 5/8" deep - cut out - 30 1/2" x 9 1/2"
Take advantage of unused space by adding one of these tilt-out tackle boxes. This large design accommodates (4) 3740 waterproof Plano boxes or 3700 standard boxes and utilizes special stainless steel hardware. Includes all mounting hardware. Plano Boxes are available if needed or use your existing boxes (9" x 14" x 2"). 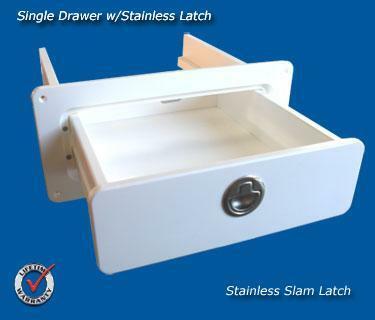 Available in white in locking or non-locking latches. Lifetime warranty. 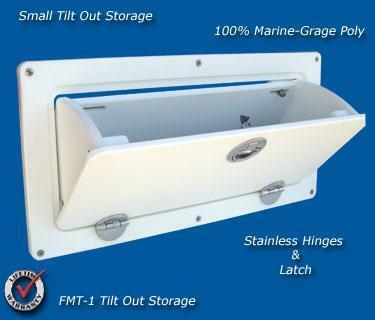 Take advantage of extra space by installing one of these flush mount tackle boxes. 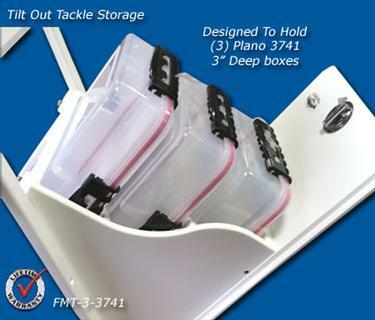 Holds 4 Plano storage boxes to store your most used items like hooks, swivels, lures, pliers, etc. 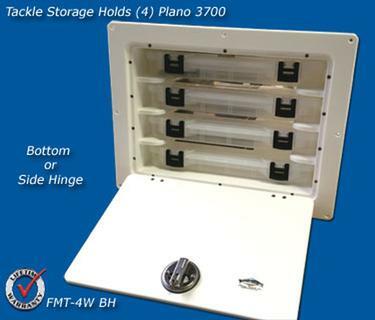 Available in white or black, bottom or side hinge (opens left or right) and includes all mounting hardware. Measures; Overall - 17 3/4" x 13 1/4" x 10 1/4" deep, cut out - 16 1/4" x 11 3/4" Need another size? We offer many sizes stock and custom contact for custom sizes. 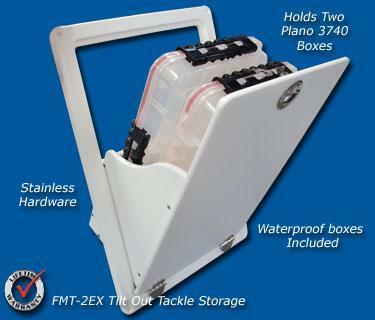 Take advantage of unsed space by adding one of these tilt-out tackle boxes. This compact design fits where others will not by utilizing special stainless steel hardware. 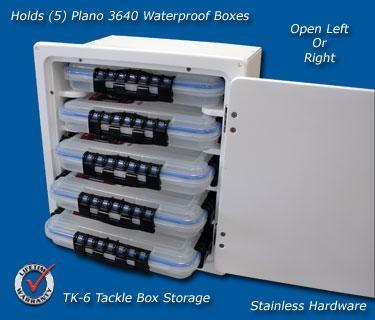 Includes (2) Plano 3640 waterproof tackle boxes and all mounting hardware. Available in white or black and has a lifetime warranty. 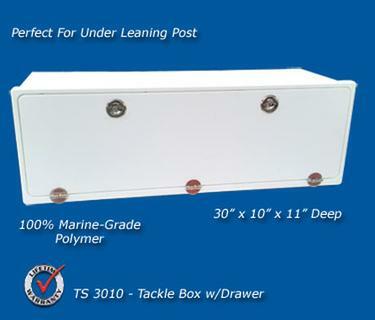 Add a drawer to your boat quickly and easily with this single 100% marine-grade polymer drawer. Available in black or white and has a lifetime warranty. Overall size; 13 1/2" wide x 6" tall x 12" deep. Cutout size; 11 7/8" wide x 4 1/4" tall x 12" deep. Call for custom size pricing. 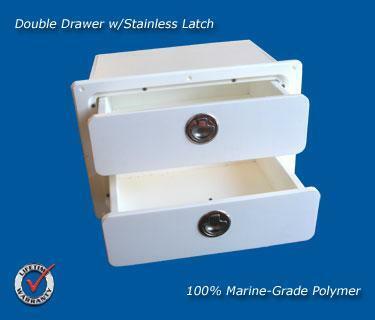 This double drawer assembly will add valuable storage space to your boat quickly and easily. 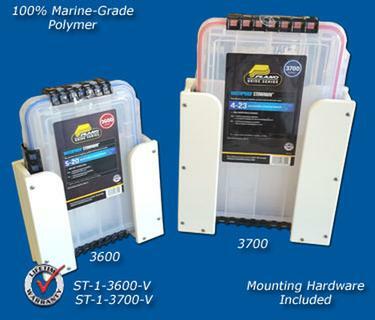 Constructed of 100% marine-grade polymer and has a lifetime warranty. Available in black or white. Overall size; 13 1/2" wide x 9 1/2" tall x 9" deep. Cut out size; 12" wide x 8 1/4" tall x 9" deep. Drawer sizes; 8 5/8" long x 7 1/4" wide x 2 1/4" tall. All mounting hardware is included. Take advantage of unused space by adding one of these tilt-out tackle boxes. 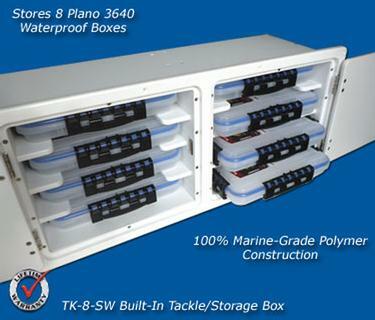 This large design holds (2) Plano 3740 waterproof boxes or 3700 standard boxes in a vertical position. 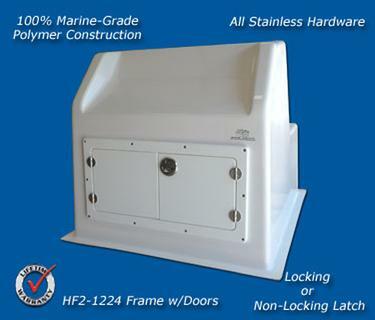 Stainless steel hinges and latch is standard with a locking latch as an option. Includes all mounting hardware. Available in white. lifetime warranty. Take advantage of unused space by adding one of these tilt-out tackle boxes. 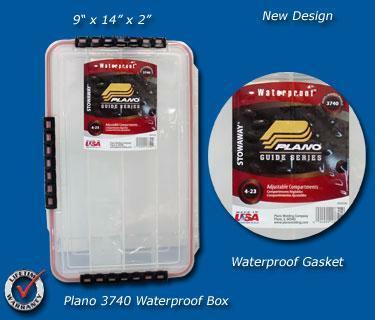 This design holds (3) Plano 3740 waterproof or 3700 standard (9" x 14" x 2")boxes in a horizontal or vertical position. 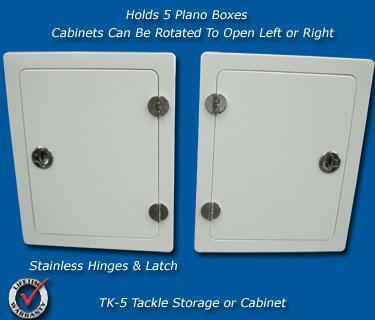 Stainless steel hinges and latch is standard with a locking latch as an option. Overall outside dimensions are; (FMT-3EX-V) 17 1/2" x 15 1/4" x 8" deep, cut out dimensions are; 16 1/16" x 13 3/4". (FMT-3EX-H) 17 5/8" x 15 1/4" x 8" deep cut out - 16" x 13 3/4" x 8" deep. (FMT-3EX-3741) 12 1/2" x 21" x 11" deep. Includes all mounting hardware. Available in white. lifetime warranty. Need another size? We offer many sizes and shapes, contact us for custom sizes. 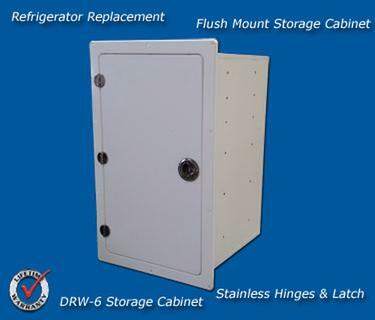 The new DRW-2M was designed due to the many requests we get for large storage options. 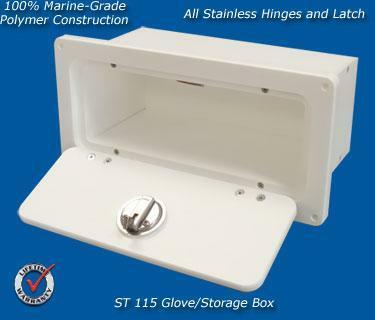 4" deep drawers accomodate many items needed for fishing and boating and is easily mounted in a 17 1/4" x 12 1/4" opening, larger sizes available. Constructed of 100% Starboard the DRW-2M is designed for the marine environment and has a lifetime warranty. Overall size; 19" wide x 14" tall x 13 3/8" deep, cut out is; 17 1/4" x 12 1/4". Note: this drawer set must be supported in rear due to large size and ability to put heavy items inside, please see PDF for instructions. 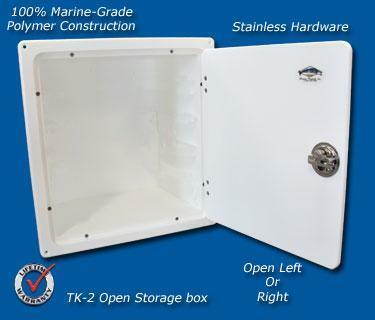 A new addition to our line of tackle storage boxes, the TK-8. Designed for the ever popular and much requested need for more storage the TK-8 fits that need. 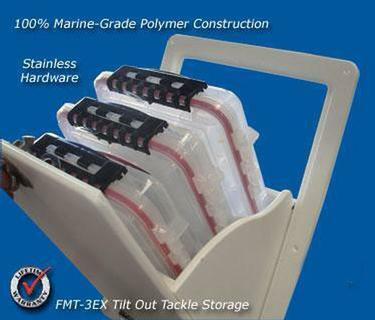 Hold up to 8 standard storage boxes (9" x 14") for a large amount of tackle storage. 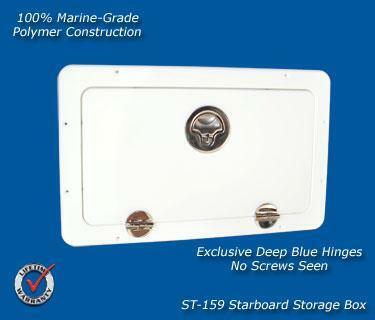 All stainless latches with locking option and Deep Blue hinges are designed for the marine environment. Use your existing Plano boxes or order waterproof (3740) or standard (3700) boxes if needed. Lifetime Warranty. Overall size; 23" wide x 12 3/4" tall x 15 1/4" deep. 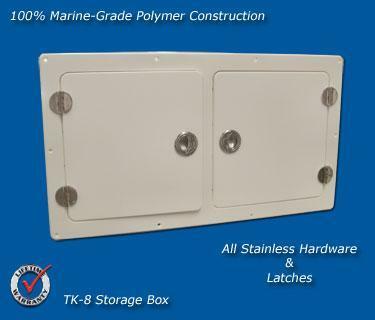 Cut out size; 21 1/4" x 11"
The TK-8-SW is designed to hold 8 Plano 3640 tackle boxes. The boxes are mounted sideways to minimize the depth required for mounting. 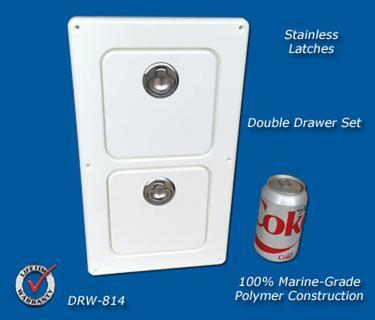 All stainless hardware is used and is designed for the marine enviroment. Starboard construction means a lifetime of use. Plano boxes are not included and are available if needed. All mounting fasteners are included. Overall outside dimension; 27 1/4" x 12 1/2" x 10" deep. 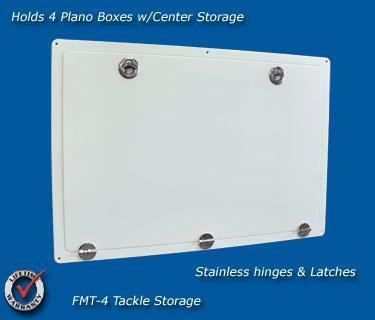 Cut out dimensions; 25 3/4" x 11"
This tackle box was designed to fit under many of todays aluminum leaning posts The TS-3010 holds (3) Plano 3740's (9" x 14" x 2") and (1) Plano 3741 (9" x 14" x 3") and has a convenient drawer which has inside storage dimensions of 12 1/2" x 8" x 5" deep. As all Deep Blue Marine products are built we use 316 stainless steel hinges and latches for a lifetime of use on the water. 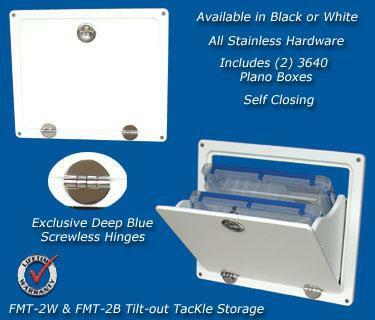 Available with locking or non locking latches. 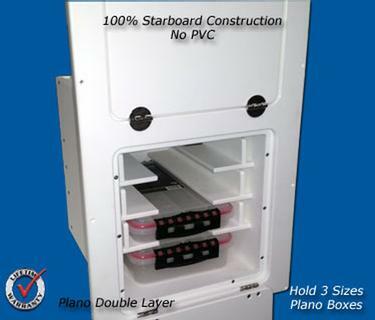 Plano boxes are not included but are available if needed and may be ordered separately. 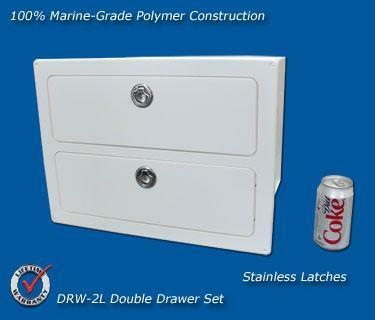 This small size double drawer set is designed for that area where you need some storage but do not have much room. Two drawers hold items like phones, sunscreen, tackle, and other small items. 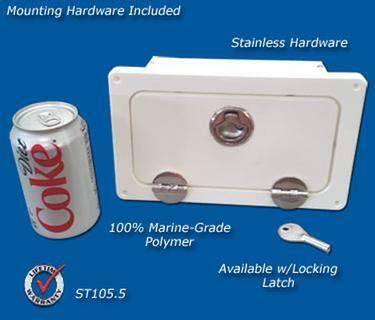 Locking latches are available and has a lifetime warranty. Overall dimensions; 8" wide x 14" tall x 6" deep. Cut out; 6 1/2" x 12 1/2". 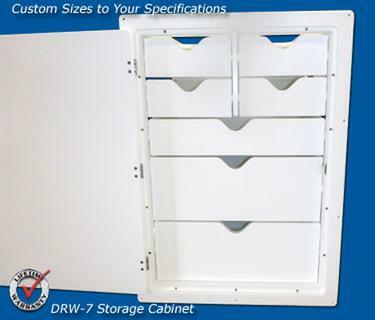 Drawer size; 5" x 3 1/4" x 3 3/4" deep (x 2) Need another size? call us to get a quick quote! Another of our drawer designs with multiple size drawers for maximum versatility. 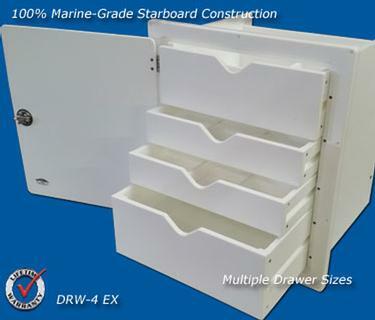 The same Starboard construction as all of our drawer sets, this unit will give a lifetime of service. Need a different size? Call for custom fit made to spec for your space. Removable dividers are available.